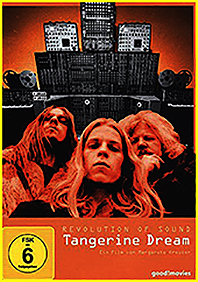 EDGAR FROESE and his band TANGERINE DREAM in search of the ultimative sound. REVOLUTION OF SOUND is a must-see for the TD fan - a music historical survey of the pioneers of electronic music starting their career in the late 60ies until today. Including interviews with Jean-Michel Jarre, Volker Schlöndorff, Michael Mann, Richard Branson, Thorsten Quaeschning, J. Schmoelling, P. Baumann, J. Froese, Bianca Froese-Acquaye, Margarete Kreuzer etc. A great portion of the film material was recorded by the founder and head of Tangerine Dream EDGAR FROESE himself who was an avid cameraman a whole life time. Sadly Edgar died in 2015 shortly after the crew started shooting the film. Bianca and Margarete decided to continue this important project and used a lot of original quotes from Edgar's autobiography FORCE MAJEURE as a basis for the film. Thanks to Tag/Traum, ARTE, WDR and the TD fans all around the globe who made it possible that this exciting documentary could be realised. SHIPPING START: 20th AUGUST 2018 !! !